Here is my coursework for week 4, modelling plants. I tried to go a little beyond the coursework by adding additional plants in the mid-ground to improve blending with the background and tried to create some openness and depth to the scene. Edit: Fixed the ivy leaves pointing in the wrong direction. 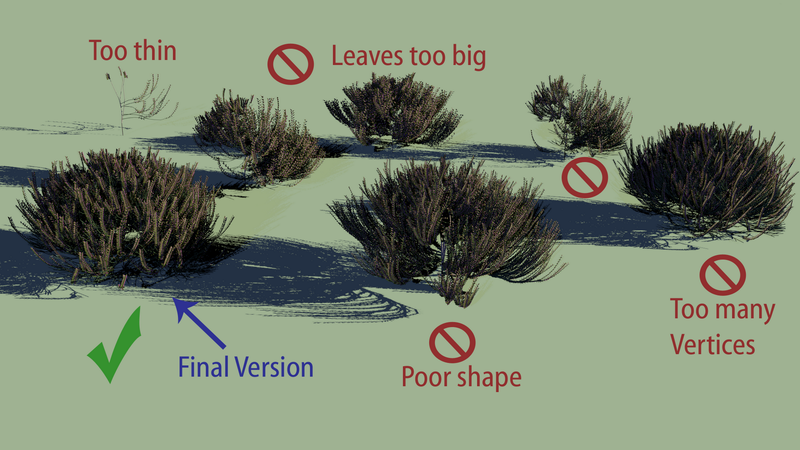 Separated the plants in the mid-ground onto its own render layer so that the colour and alpha could be blurred to better match the background. Previous version below for comparison. Hmm, I couldn't leave it, I moved the Scots Pine much closer to camera and increased the grass. I am much happier with this version. Note: click on any of the pictures on this site for a larger version. 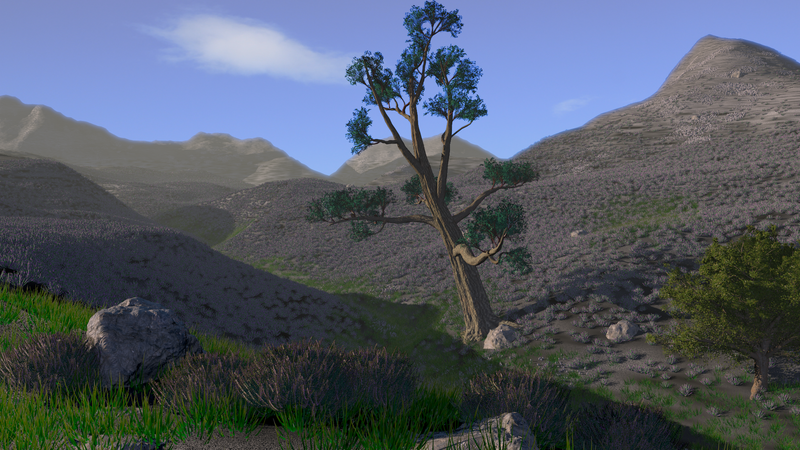 Edit: one last tweak made, fixed a texture issue on the pine, scaled the foreground heather up a bit, added roots to the pine, made the scree a bit darker. Phew, this one pushed my PC to it's limits. Finally there. Biggest difficulty was figuring out how to separate the tree to it's own render layer and then re-integrate it properly back into the scene. I also had a repeated crash when trying to work on the compositing nodes. 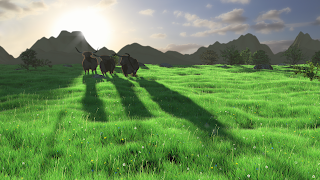 I updated Blender from 2.57 to 2.58a and it sorted the problem. 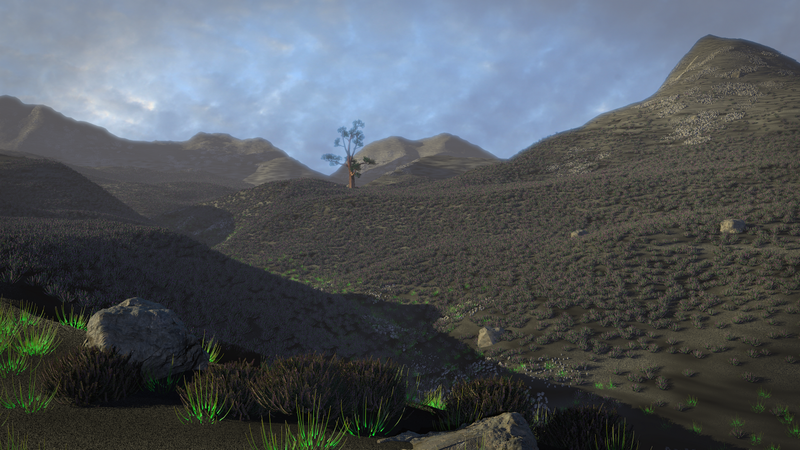 I have always wanted to create a mountainside covered in heather in Blender. So I used this weeks tutorial to create heather in Arbaro, import it into Blender and add materials and textures. I didn't think I would get away with a small shrub as my tree project, so I also created a scots pine in Arbaro. One problem, Arbaro won't let you control the distribution of stems on a branch. I ended up creating two models for the tree. One for the main trunk and branches and another for the smaller branches and needles, and fitting it all together in blender. 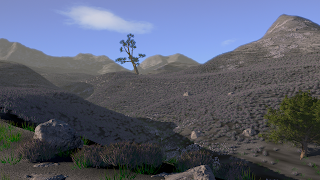 For the image, as well as the heather (foreground), I also had a field day with particle systems for low poly heather (an instanced model with about 40 verts), scree and grass. I used weight painting to control what went where. Update: I am really struggling with the components of the image here. 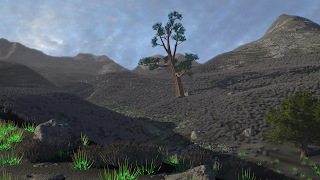 I put the tree on a separate render layer to avoid it being influenced by the sky bleed on the mountains. Now I am having to do extra tutorials to figure out how to re-incorporate it back into the scene. And I still have glow-in-the-dark grass! Getting to grips with the Arbaro programme. This looks pretty powerful, especially when adding textures and modifiers for close-up work. Week 3 coursework from The Nature Academy is trees using Arbaro, a free tree generator. 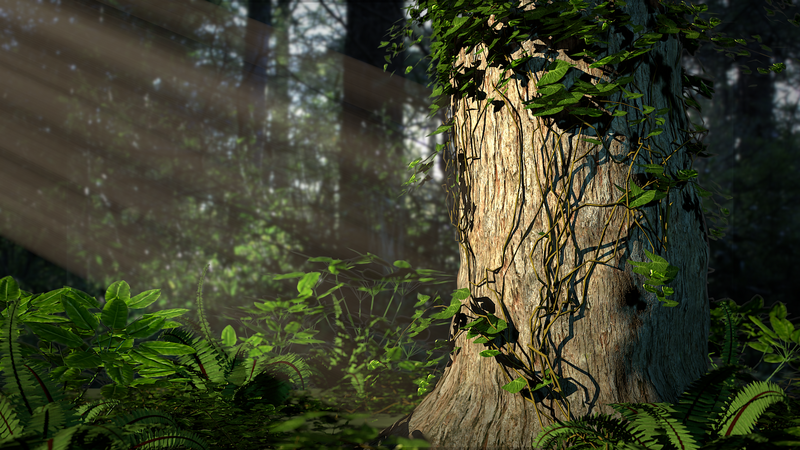 Following the tutorial, I added the large oak-like tree on the left. I then tried using the software to create heather for the bottom left. The tree is really good, I am less happy with the heather, I will need to continue experimenting. 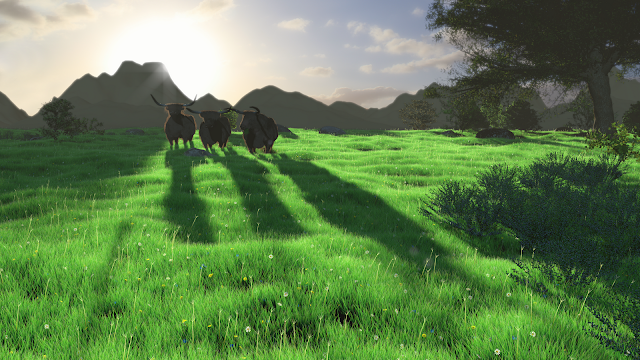 Titled: Coos in the Glen. An attempt at animating the grass scene. There was a lot of trial and error with this one, the camera speed was tricky to get right. I ended up cheating by repeating the first 14 frames to pad out the start. It would have taken too long to re-render. Almost 24hrs of render time to get these 215 frames / 9 seconds of video. Title: Coos in the Glen, the movie. 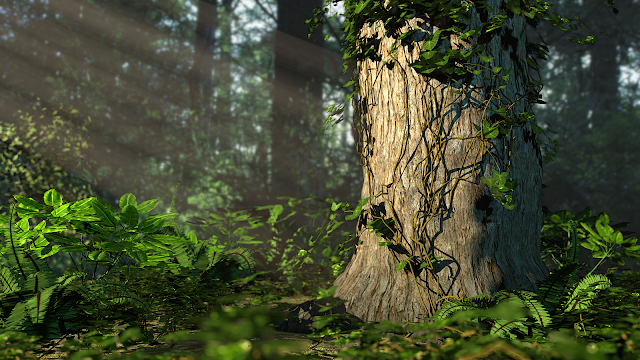 Here is my submission for week 2 of the Nature Academy (www.blenderguru.com). 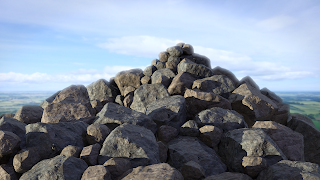 I have modeled the rocks in the foreground and formed them into a cairn.